1 2 3 4 5 Click to share your rating 42 ratings (4.4/5.0 average) Thanks for your vote! 58.28% of people buy Eclipse: Twilight Saga #3 and New Moon: Twilight Saga #2 ~ Paperback / softback ~ Stephenie Meyer. "Best book in the series." ‘Eclipse’ is my favourite book in the saga. Things get pretty steamy when Bella, Edward aaaand Jacob are all sleeping in the same tent when they are trying to keep Bella safe from the evil red-headed Victoria. With the blurb on the back making you want to open the book THAT much more, I recommend this fantastic book written by the best-selling author Stephenie Meyer. "DON'T WAIT FOR THE MOVIE!" I watched “New Moon” at the cinemas and I wasn't satisfied with where it ended. I'm not waiting for the movie so I decided to read the novel instead. Honestly, reading is not my thing and yet I manage to read this whole book in three days, that's how good this read is! Anyway, I won't get into details because the mystery is worth the search, however I will let you know that in this book of the series, each of the main characters from the “Were-wolves” to the “Vampires” will get a decent portion in the book about their origins which will affect your experience as you soak into this world of action, romance and horror. "Third book in the thrilling vampire romance series." 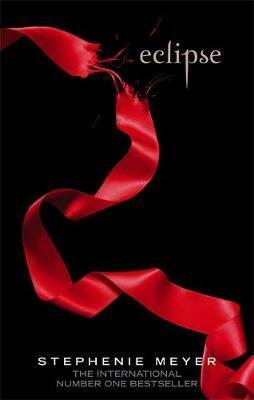 A thrilling vampire romance, the third book in the Twilight Saga is definitely the best yet. After Bella's life is torn and broken in New Moon, in Eclipse it looks ready to heal, twining both vampire Edward Cullen and werewolf Jacob Black into it. In this book, the ravenous vampire Victoria has amassed an army of newborn vampires and is posed to attack the small town of Forks, Washington. Bella must help Jacob and Edward strengthen their relationship and be able to make werewolves and vampires work as one in order to overthrow the massive threat opposing them. 'Bella?' Edward's soft voice came from behind me. I turned to see him spring lightly up the porch steps, his hair windblown from running. He pulled me into his arms at once, and kissed me again. His kiss frightened me. There was too much tension, too strong an edge to the way his lips crushed mine - like he was afraid we had only so much time left to us. As Seattle is ravaged by a string of mysterious killings and a malicious vampire continues her quest for revenge, Bella once again finds herself surrounded by danger. In the midst of it all, she is forced to choose between her love for Edward and her friendship with Jacob - knowing that her decision has the potential to ignite the ageless struggle between vampire and werewolf. With her graduation approaching, Bella has one more decision to make: life or death. But which is which? Following the international bestsellers Twilight and New Moon, Eclipse is the much-anticipated third book in Stephenie Meyer's captivating saga of vampire romance.